Lasers, next-generation lighting and tomorrow's technology will be demonstrated in interactive displays this spring at the USA Science and Engineering Festival booth staffed by volunteers representing SPIE, the international society for optics and photonics, an Official Partner of the festival in Washington, D.C.
A demonstration at the 2010 festival inspires children with the wonders of science and engineering. The festival sends a very clear message to young minds that science and engineering are fun, useful, and excellent career choices. Lasers, next-generation lighting and tomorrow's technology will be demonstrated in interactive displays this spring at the USA Science and Engineering Festival booth staffed by volunteers representing SPIE, the international society for optics and photonics. SPIE is an Official Partner of the festival, hosted by Lockheed Martin and other sponsors 28-29 April at the Walter E. Washington Convention Center in Washington, D.C.
SPIE will also participate in the Festival Finale Expo kick-off with an invitation-only "Sneak Peek Friday" on 27 April for underserved schools, homeschoolers, military families and House and Senate members. The SPIE booth will offer several opportunities to play with light and discover how future technology will use light in numerous ways. SPIE members will be on hand along with staff both days to answer questions about photons and their capabilities. Among the optical scientists at the SPIE booth at the 2010 festival were SPIE Fellows Carmiña Londoño of NSF (National Science Foundation) and Michael Postek of NIST (National Institute of Standards and Technology). "The festival sends a very clear message to young minds that science and engineering are fun, useful, and excellent career choices," said Londoño, an NSF program director who feels strongly about reaching out to the public to emphasize how exciting science and technology are. "As an engineer, I believe that actively participating in science and engineering outreach is a social responsibility that comes with the privilege of having had the opportunity to study engineering," she said. Postek, a senior scientist at NIST, agreed, adding that "the future of our nation hinges on our ability to prepare our next generation to be innovators in science, technology, engineering, and math (STEM)." "The excitement and wonderment shown on the children's faces during the USA Science and Engineering Festival in 2010," he said, "clearly demonstrated the exceptional value of the effort taken by SPIE and the other participants to strengthen this critical effort." The 2012 festival will feature 100 stage shows, 33 author presentations, a book fair and a career pavilion for high school students including a job fair, career fair and networking opportunities. SPIE, the international society for optics and photonics, was founded in 1955 to advance light-based technologies. Serving more than 225,600 constituents from 150 countries, the Society advances emerging technologies through interdisciplinary information exchange, continuing education, publications, patent precedent and career and professional growth. SPIE annually organizes and sponsors approximately 25 major technical forums, exhibitions and education programs in North America, Europe, Asia and the South Pacific. 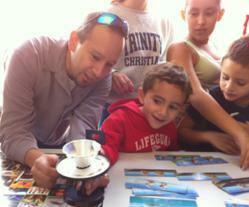 SPIE provided over $2.5 million in support of education and outreach programs in 2011.